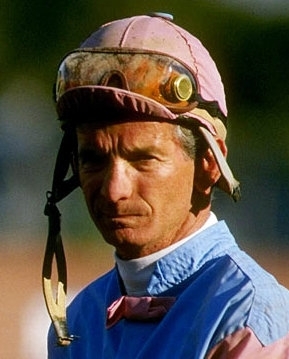 Bill Shoemaker (born as William Lee Shoemaker in Fabens, Texas, U.S.) was a famous Athlete from USA, who lived between August 19, 1931 and October 12, 2003. He became 72 years old. William Lee Shoemaker was an American jockey. He was one of the most successful jockeys of all time and was called "Bill" "Willie" or "The Shoe" called. Shoemaker was 1,250 grams at birth so easily that he only was given little chance of survival. He survived, but remained as many underweight babies and small weighed later at a height of 1.50 meters, about 43 kilograms. These body dimensions but predestined him to jockey. His career began as a teenager, when he 19 March 1949 his first professional race denied. The first of its total of 8833 victories during his career came just a month later, on 20 April 1949 "Shafter V". Shoemaker won the 1951 George Woolf Memorial Jockey Award, and received 30 years later, the Eclipse Award for Outstanding Jockey in the United States. In 1958 he was inducted into the Hall of Fame of the American horse racing. Shoemaker won eleven Triple Crown races during his career. He is born under the zodiac leo, who is known for Ruling, Warmth, Generosity, Faithful, Initiative. Our collection contains 4 quotes who is written / told by Bill. "When you're riding, only the race in which you're riding is important"
"There are one hundred and ninety nine ways to beat, but only one way to win; get there first"
"If Jack Nicklaus can win the Masters at 46, I can win the Kentucky Derby at 54"
"Desire is the most important factor in the success of any athlete"